We have just completed the second year of our unique three-year national Riverfly Census. The census aims to assess the health of our English and Welsh rivers through monitoring water insects that live below the surface. This important research has revealed that nationally no significant improvement in the condition of our rivers and chalkstreams has occurred on the 12 core study rivers included over the past two years. The results from the River Wensum indicate that pollution is a significant concern for this chalk stream. The threat to our rivers has moved from industrial pollution to a range of more subtle but equally damaging impacts from excess phosphates and fine sediments. These enter our waters from sources such as farming and road run-off, poorly treated sewage, septic tanks, new developments and in certain areas discharges from watercress and fish farms. Five sites were surveyed on the Wensum: Doughton Bridge, Fakenham Common, Pensthorpe Park, Sennowe Bridge and Bintry Mill. Mayfly species richness is under the level that would be expected for the middle reaches of a healthy chalkstream at all sites. In spring and autumn, sediment was at or above the level considered to have a detrimental impact on the invertebrate community for all five sites. Phosphorus levels were also at or above the level of concern at four sites in spring and two in autumn. Taken together, the spring and autumn results in 2016 show the Wensum's water quality is under severe pressure from sedimentation and phosphate. "The results from the 2016 spring and autumn counts are concerning and reflect an increasing level of pollution entering this important chalkstream. Although the Wensum story is mostly negative, we were very encouraged by the passion of the farmers to help restore the river when we met last year. It will take time to get the river back to a healthy condition, but I am sure the dedication of the farmer's working on their stretches of the Wensum will help to ensure ecological improvement occurs over the next few years." 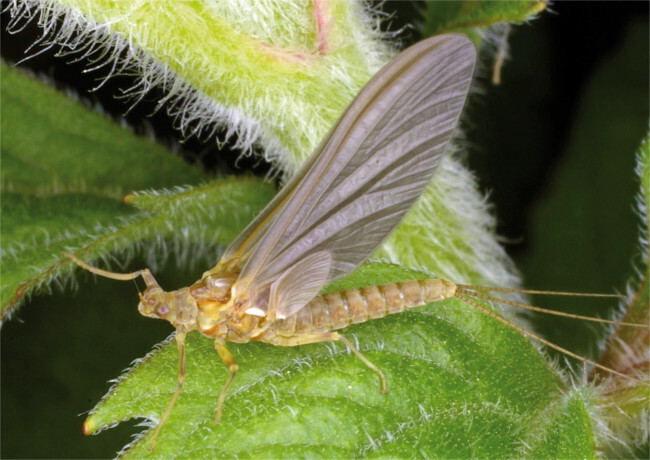 Understanding why and to what extent riverfly numbers, such as blue-winged olives, are declining is the first step in the process of safeguarding the aquatic environment. "The aim of our Riverfly Census is to provide an accurate picture of water quality, to gauge the problems we are facing and to identify workable solutions to restore degraded watercourses. To do this, we analyse the invertebrates down to individual species rather than families. The increase in resolution is akin to moving from a magnifying glass to a microscope. The evidence from our Census is irrefutable. Increased phosphates and fine sediments are having a disastrous impact on invertebrate communities in our rivers. Loss of flylife causes major disruption to the delicate balance of the aquatic food chain, with fish, mammals and bird populations suffering as a result." As can be seen from the results of S&TC Riverfly Census on the Wensum it is imperative that people who care about their local river start to act now. "Our rivers and chalkstreams are wonderful places of solace. However, although these rivers may appear healthy, our research shows that things aren't always how they seem." We would like local people to help change the way our rivers are managed by demanding better protection and monitoring. We would urge them to get in touch with us so that we can take forward issues with local MPs or the Environment Agency. This is a call to arms to everyone to help save our rivers and the important aquatic wildlife that clean water supports.